Common carrier shipping is one of the main ways that WebstaurantStore gets your orders to you quickly and safely. Common carrier deliveries are shrink-wrapped and shipped on wooden pallets on large 18-wheeler trucks, which also allows them to handle larger orders that are too big for standard parcel carriers. In this post we'll cover the process of placing an order for a common carrier shipment, what's expected of you (the customer) to successfully receive a common carrier shipment, and some frequently asked questions about the shipping process. 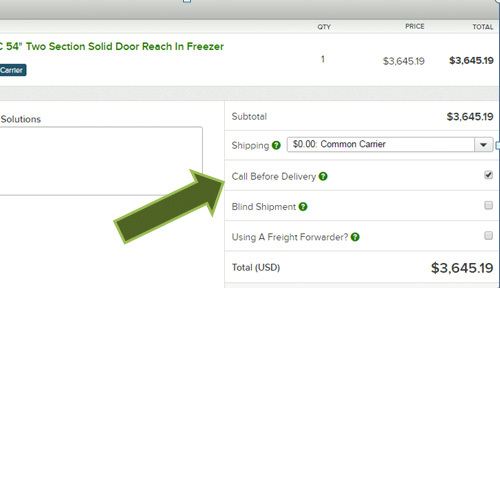 During the checkout process, you will have the option to add liftgate service or request a call before delivery to your order. Additionally, there is a comments box during checkout where you can add any comments about your order or any shipping requirements you may have. Once the order has been placed, you will get a confirmation email from us with all of the relevant information about your order and shipping. Any special instructions for drop off, such as call before delivery or liftgate service. The carrier will come to one of our warehouses to pick up your order, and we will load it onto their truck. When the carrier picks up the order, they'll sign the bill of lading to signify that they received the shipment. The proof of delivery is a delivery receipt that you must sign upon delivery of the shipment. The carrier will provide you with the POD upon delivery of the shipment for you to sign. The carrier will arrive with your order, and you can use a forklift or loading dock to unload your order. The driver of the truck will not help you unload your order, unless you added liftgate service to your shipment. And even if you chose liftgate service, they will help you get the order down, but not inside your business. Once you have taken your order off the truck, inspect the package for any potential damage or missing pieces. After confirming that all of the items are accounted for and everything is in the correct condition, sign the proof of delivery and return it to the driver. The carrier will arrive during standard business hours, which is between 8 and 5. If you chose call before delivery, the driver will contact you approximately 1 business day before the delivery to arrange a 4 hour delivery window. It's important to note, though, adding call before delivery will typically add an additional business day to the shipping time. Customers that aren't present during for delivery may be subject to a $65.00 re-delivery fee. 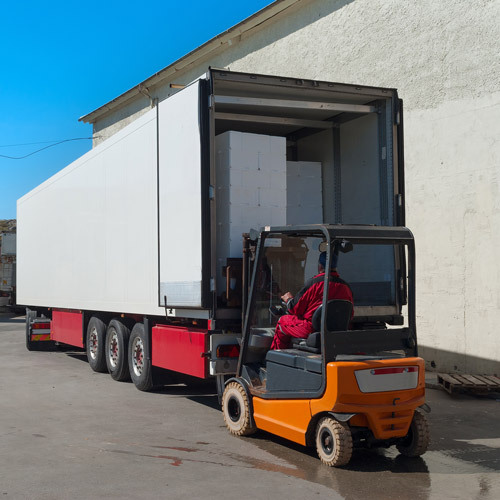 Once the carrier arrives at your business or residence, it's your responsibility to unload the truck with a forklift or a loading dock. If you added liftgate service to your order, the driver will help you get the order down, but it's your responsibility to bring your order inside. Additionally, if your order is small enough, you may be able to get into the truck to remove it. Typically, most carriers will give you a 15 minute window to unload your order and then inspect it for any damage and to ensure that all of the pieces are accounted for. If you notice anything that is missing, make sure to note it on the proof of delivery. If you're missing items but do not list them on the POD, we cannot guarantee compensation. If you notice that the packaging has been damaged, you can open it to inspect the contents and check if they have been damaged as well. If your items have been damaged, be sure to note it on the proof of delivery and take pictures of the damaged items and the packaging. Additionally, please contact our Customer Service team within 24 hours of receiving the order if your order is damaged or missing items. Liftgate is an optional service that we offer that makes it easier to receive your common carrier shipments. The liftgate is a motorized platform on the back of the truck that will lower your freight from the truck down onto the ground. This service is ideal for customers that don't have a forklift or loading dock that they can use to unload the truck. Additionally, liftgate is ideal for orders that are going to residential addresses. 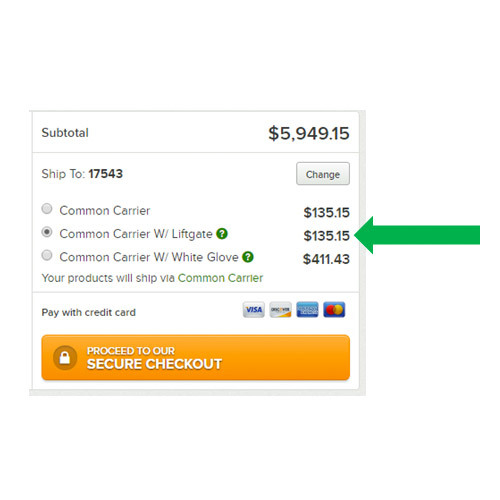 Adding liftgate service to your delivery costs $45.00 if you add it during checkout. Liftgate is automatically added to all common carrier deliveries to residential addresses. The driver may help you get your freight down using the liftgate, but they will not help you get the order inside. Call before delivery is an additional service that you can add to your common carrier shipment to make delivery more convenient. Call before delivery requires that the carrier calls you one business day before delivery to arrange a delivery time frame, which is typically a 4 hour window. This service is convenient, because it allows you to set up a time that works for you and lets you know when to expect the delivery. It is free to add call before delivery to your order. This service is optional for commercial customers, but it is required for common carrier shipments going to residential addresses. Call before delivery may add an additional business day to your shipping time. If the carrier misses the appointment, a new appointment will be made with no additional charge. If you miss the appointment, there is a $65.00 re-delivery fee. Your order exceeds weight capacity or size requirements. The order includes potentially hazardous materials, such as some types of cleaning chemicals or chafer fuel. The warehouse shipping supervisor deems common carrier the safest method for delivery. How much is the re-delivery fee? If you miss the shipping appointment, you will be charged $65.00. When will I get the call before delivery? The carrier will call you approximately one business day before your delivery. How do I receive a shipment at a residential address? If you're having a common carrier shipment delivered to a home business, liftgate and call before delivery services are required. My common carrier shipment shows that it has been delivered, but I haven't received my shipment yet. In this case, your order may have been delivered to an interline carrier. Interline carriers are often used in large cities or rural areas to complete deliveries. To check if your order is with an interline carrier, please contact our Customer Service team to check the proof of delivery.